Kids delight in pulling fresh carrots from the garden for a quick summer treat, as young carrots are sweet and tender. But, growing carrots in the home garden isn't just for kids. These nutritious vegetables are easy to grow and can be harvested and stored for winter use, once they mature in late summer or early fall. Light: Choose an area that receives 6 to 8 hours of direct sunlight a day. Hours of sunlight do not need to be consecutive, but they must add up to at least 6 hours. Prepare the Soil: Carrots require deep, loose soil for their roots to grow. If planted in shallow or rocky soil, roots bend and twist as they work their way around rocks. Although these oddly shaped carrots may entertain your kids - if you want straight carrots, till the soil deeply and remove large rocks and other debris. Amending the soil: Add generous amounts of compost or well-rotted manure to the soil to improve its texture, improve aeration and promote good drainage. Organic matter also provides slow-release nutrients to the soil. Fertilizer: Apply starter fertilizer before planting carrots in the spring. Follow the recommended application rate for 5-10-10 or 10-10-10 fertilizer and work into the top 6 inches of soil before planting. Sowing Seeds: Sow carrot seeds in the spring about two weeks before the last expected frost in your area. Plant these tiny seeds ½ inch apart in rows. Carrots can also be planted in a wide row by scattering the seeds over the top of the soil. Cover lightly with soil and firm down to secure the seeds. Water to moisten the soil and keep the soil moist until seedlings emerge in 7 to 21 days, depending on the soil temperature. Carrots sprout in as little as a week in soil at 75 degrees Fahrenheit, but may take three weeks to germinate if the soil is in the 50's. Thinning: Thin carrots to 1 to 2 inches apart when the seedlings a 2 inches high, typically by pulling every other seedling. Watering: Water carrots deeply once or twice a week to keep the soil evenly moist, as these vegetables require even moisture to produce the best crop. Weeding: Mulch with organic mulch, such as grass clippings or straw, to create a weed barrier. Mulch also helps maintain moisture keeping the soil moist. Harvesting: Young carrots can be harvested and eaten as soon as they have reached the desired size. Pull or dig mature carrots in the fall before the ground freezes. Allow to dry in a shaded area for 24 hours. 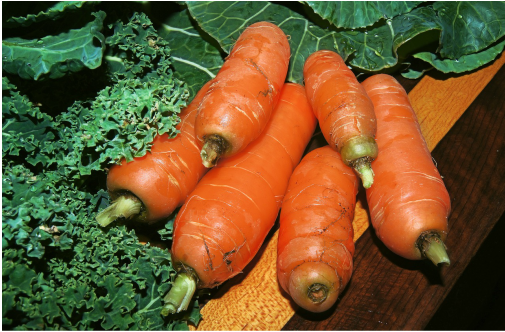 Remove excess soil and store the carrots in a root cellar or other cool, dry area for winter use.